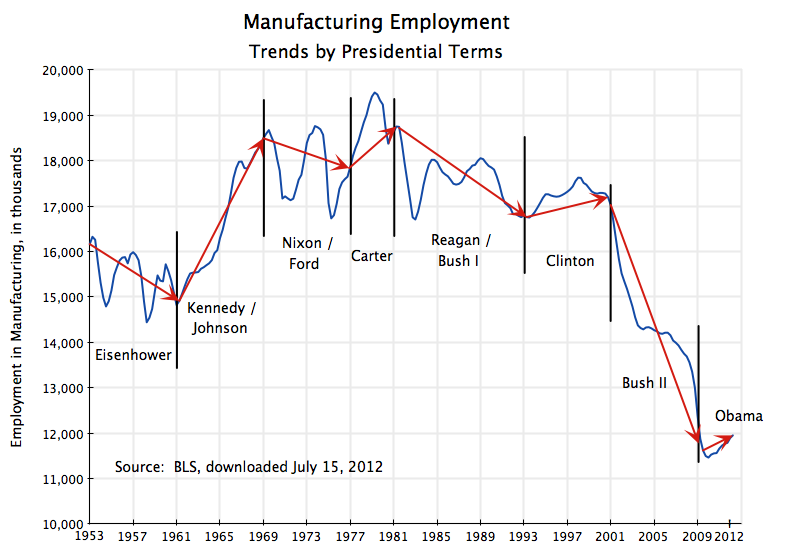 Manufacturing employment in the US plummeted during the term of George W. Bush, and has started to recover under Obama. There were 27% fewer manufacturing jobs in the US when Bush left office than when he took the oath of office in January 2001, an overall loss of 4.6 million jobs in the sector. The fall was often rapid, but what is striking is that they fell in each and every year of his administration. And this collapse in manufacturing took place during a period when the economy grew overall. Economists debate whether manufacturing jobs are inherently better for the economy than jobs outside manufacturing at the same wage (where the arguments center on the linkages to the rest of the economy, and on whether manufacturing experience leads to more rapid growth in technology and hence productivity or not). But regardless of the position taken on this debate, economists agree that the sharp fall of manufacturing jobs during the Bush period was unhealthy. Economic imbalances built up during the eight years Bush was president: The housing bubble developed, there was an excess of consumption (and hence a fall in savings) spurred by the Bush tax cuts and by financial deregulation (easy loans), and there were the large fiscal deficits under Bush due to these tax cuts as well as spending on two major wars that were not paid for except by borrowing. This led to record high trade deficits, appreciation of the dollar, and a manufacturing sector that could not then compete with imports. Manufacturing jobs have begun to recover under Obama. Such jobs were plummeting and at an accelerating pace when he took office, falling by 297,000 in January 2009 alone. This started to turn around almost immediately after he took office (along with total employment), due to the stimulus package and other measures. The loss of manufacturing jobs immediately started to slow, and by early 2010 started to grow for the first time since Clinton. It is still early, but the change in trend is clear. It is also interesting to go back further. The figure above shows the number of jobs in manufacturing in the US going back to Eisenhower (the data is from the Bureau of Labor Statistics). I have broken up the figure by presidential terms. Excluding Obama (as his term is not yet complete), there have been seven presidential periods (combining terms with presidents of the same political party): four Republican and three Democratic. Manufacturing jobs fell in each of the Republican periods, while they rose in each of the Democratic periods. And the pattern indeed goes back further. Manufacturing jobs rose under Roosevelt and under Truman (even if one treats Truman as a separate period, and despite Truman taking office when war time manufacturing employment was still high). They fell under Hoover. One has to go back all the way to Calvin Coolidge, President from 1925 to 1929, for a Republican during whose term manufacturing jobs rose. Much has of course varied over so many decades, plus there have been wars and other such factors affecting the numbers. But there has also been a certain degree of consistency of policies within each party, with changes that are generally gradual (reflecting evolution over time) rather than abrupt. Senior officials in each new administration will have generally served in some capacity in a prior administration of the same party. It is nevertheless striking that there has been this 100% consistency in performance between the two parties when it comes to jobs in manufacturing: The number of jobs have always improved under the Democrats, and have always (since Coolidge) deteriorated under the Republicans. If you are interested in seeing such jobs grow, vote Democratic, not Republican. This entry was posted in Labor and tagged employment growth, jobs, Obama by aneconomicsense. Bookmark the permalink.